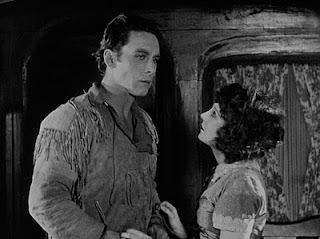 The 15th edition of the San Francisco Silent Film Festival (SFSFF) pulled into the station with John Ford's romanticized western The Iron Horse (1924), starring George O'Brien and Madge Bellamy. Festival favorite Dennis James—who provided musical accompaniment on the Castro Theater's Mighty Wurlitzer—also provided the only surviving 35mm print of the American version, courtesy of 20th Century Fox. Joseph McBride, author of Searching For John Ford (2001) offered historical context to help the audience further appreciate SFSFF's opening night film. McBride was recently in Bologna, Italy for the Il Cinema Ritrovato, which is a festival dedicated to the rediscovery of rare and little-known films with a particular focus on cinema origins and the silent movie period. 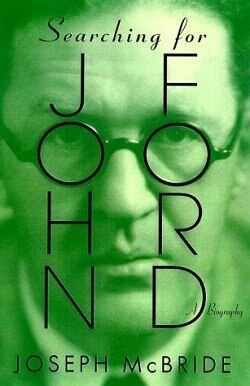 The festival's subject focus this year was on John Ford. McBride recalled that—when he began researching Ford in the 1960s—there were only five or six silent Ford films that anyone could find, including The Iron Horse. 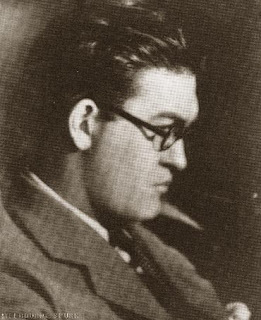 Since then, nearly 25 silent films from Ford's early career have been rediscovered, either in partial or complete condition, such that this period of his creative output has become much more visible and available. Who put all his troopers aboard. To make a big feature. "Oh Lord!" The shoot was quite an adventure. Ford was only 29 years old at the time but The Iron Horse was already his 50th feature film. He had started directing at the age of 17 and would go on to direct a total of 54 westerns in his amazing career, which included 137 films to his credit. Certainly, Ford is acknowledged as the master of the western genre. The Iron Horse was a pivotal film in his career for many reasons but McBride likes to say that The Iron Horse was to John Ford what Jaws was to Steven Spielberg. 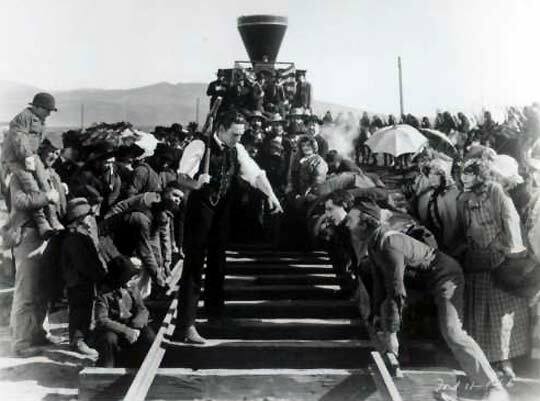 It made him a famous director, even though The Iron Horse was an ambitious, out-of-control runaway production that went way over budget and over schedule. 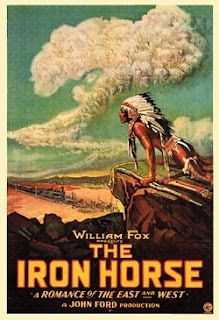 His studio Fox Film was having a hard time financially but The Iron Horse became a major hit when it opened and made Ford bankable for the remainder of his career. The Iron Horse was, in effect, Ford's response to Paramount's "super western" The Covered Wagon (1923). Ford's film, however, was about building the First Transcontinental Railway: a great American saga. The company worked on the Pyramid Lake Paiute Indian Reservation near Wadsworth, Nevada [known, perhaps, to participants in the Burning Man festival as the exit from Interstate 80 that one takes to get to Black Rock City]. They drew people from Reno and surrounding areas to be extras in the film. The extras were told to bring their own props and costumes to reflect the period 1860-69. The production crew recreated the building of the railroad in great detail. They built an entire town and moved the town as the tracks were being built, much as it had been done in real life. The company lived in the circus train; in a sense, like real pioneers. This rough and tumble company shot in the snow under adverse winter conditions. Ford hired old-time Western lawman and expert marksman Ed "Pardner" Jones for sharpshooting stunts. Once, Fox Film's production manager Sol Wurtzel sent a telegram to Ford urging him to speed up the shooting. Ford took the telegram, folded it, and held it up, telling Pardner Jones to shoot right through Sol's name, which Jones did; he was such a great shooter. Another time, Ford had someone shoot a clay pipe out of the mouth of an actor who wasn't prepared for it and this infuriated Ford's brother Eddie, the film's assistant director, who took a pick-axe and went after his brother. They had a monumental brawl. That's the kind of production it was. 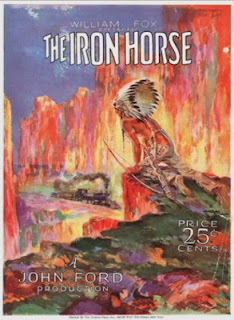 In the 1960s Ford considered writing a book about the making of The Iron Horse and McBride's wife quipped that it would be more pornographic than foreign literature. She was, perhaps, alluding to the brothel Ford set up to service members of the film company. You could get overnight accommodations, a bath, a haircut, and laundry service all for $5. So they weren't totally deprived on location. They spent two months filming in Nevada, soliciting the cooperation of Paiute Indians from the reservation, along with Chinese who had actually worked on the railroad, and—allegedly—even used the locomotives that met at Promontory Point when the two ends of the line were joined on May 1869 [although other sources claim these were replicas]. McBride opined that Saul Wurtzel deserved credit for letting Ford keep shooting even though he was over budget and schedule. Wurtzel had seen the quality of the footage. The Iron Horse, McBride characterized, has the authentic look of a reconstructed documentary, which can be said in general of Ford's best westerns: they look like documentaries, even as they're visions of an idealized world with Ford's great eye for composition. Within that, Ford encouraged spontaneous rough-housing acting, usually on the first take, to make the film seem real. He created a vision of the American past that audiences found believable. 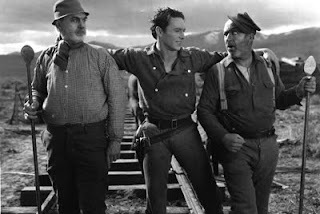 Today, the plot of The Iron Horse seems kind of hokey; but, it's the film's visual spectacle that remains impressive: the flowing movement of trains, horses, and buffalo, which Ford orchestrated with virtuosity, especially the last 40 minutes of the film as it reaches its crescendo. Added to this, Ford introduced small character touches to keep the film on a human scale. He was paying tribute both to the unification of the United States by the railroad through Abraham Lincoln who had the foresight to do this during the Civil War, and to the immigrants who actually built the railroad: the Chinese, the Irish, the Italians, and other immigrant groups. Ford had an uncle named Mike Connelly who was an Irish shooter who came over to serve in the Union army and to help build the railroad so Ford was honoring his Uncle Mike's story. For the people working on this film, this was real history. Ford liked to call the film The Metallic Mustang. That was his other name for it. It played for months and moved audiences to tears with its recreation of the American past. 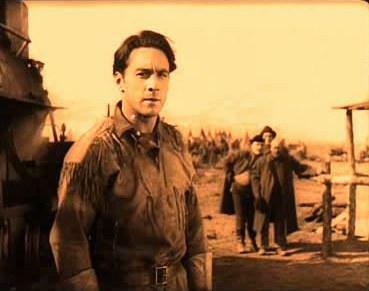 After The Iron Horse, Ford made another silent western Three Bad Men (1926), which unfortunately flopped. Then Fox made The Big Trail directed by Raoul Walsh featuring John Wayne in his first starring role and that also flopped. Audiences had lost interest in these super westerns. Ford returned to the western genre in 1939 with Stagecoach, which has been recently released on Criterion DVD. From that point on, Ford was on a roll and he solidified his reputation as—not only the master of the western genre—but, in McBride's estimation, America's national poet and the closest we have to William Shakespeare. Hopefully, David Kiehn's immaculately-researched essay for the SFSFF souvenir program will be replicated for SFSFF's archives in the near future to keep company with the already generous sampling of essays from past editions of the festival. Adding production details to McBride's introductory comments, Kiehn depicts a grueling and exhausting shoot in a difficult location under hazardous weather conditions. Unexpected snowfalls caused continuity issues, which Ford resolved by ordering hundreds of extras to remove the snow. The dining room steward succumbed to the cold and died of pneumonia. In a classic anecdote of ethnic masquerade, Paiute Indians from the Pyramid Reservation were brought in to double as Chinese railworkers. And a justice of the peace in Reno, Nevada looked so much like Abraham Lincoln that Ford hired him on the spot. Kiehn's essay is rich with such stories. There are two recent contributions to the wealth of research written on The Iron Horse that I would like to point out. At Long Pauses, Darren Hughes takes advantage of the Ford At Fox DVD Collection to construct a screen capture analysis of the saloon showdown scene in The Iron Horse whereby Darren emphasizes Ford's mastery of standard continuity editing through a careful purview of establishing shots, re-establishing shots, and crosscuts leading to the final showdown. It's a visually striking sequence energized by these edits. At Parallax View, Sean Axmaker takes on Ford's historical veracity in his first report from the festival, linking back to his earlier TCM essay.